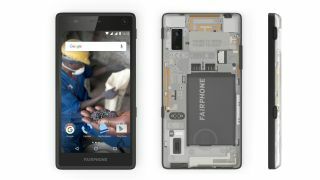 The Fairphone 2 takes an eco-friendly approach to phone design by using conflict-free materials and employing a modular design to make repairs easier, but now the company is looking to expand its products to more than just phones. This means you'll one day may be able to buy a Fairlaptop or Fairwatch from the company, one that will also be made with conflict-free materials. Fairphone CEO Bas van Abel confirmed at MWC 2017 that Fairphone is looking to diversify its product lineup, but it has no specific plans for either a Fairtablet or Fairheadphones. Abel said: “Making phones is so complicated, adding more products makes it pretty difficult. On the other hand, from a commercial point of view it's very risky to have just one product. “We don’t have plans to make Fairpads or Fairheadphones at the moment, but we’re looking into creating a portfolio of products. Fairphone is all about creating tech products from sustainable sources, and making devices that last longer and can be repaired easily. Sustainability is set to become a far bigger issue for the gadget-buying public as resources to create our gadgets become harder to mine or produce, and because of a rise in interest from consumers who don't want the production of their devices to harm the environment. Companies like Fairphone won't suddenly become Apple rivals with this stance, but they're showing the direction that could be taken, and highlighting key messages that smartphone buyers need to be aware of. It's unlikely we're going to see new Fair products ready to buy in the near future, but the fact that Fairphone is looking to diversify does point toward a future where you can kit yourself out with guilt-free tech.